Tiny homes have caught on for a number of reasons. They can conserve energy, save on mortgage costs, and encourage a more mobile lifestyle. Most recently, they’ve become a popular branding technique for major companies. In November, Dunkin’ Donuts unveiled a tiny home that ran almost entirely on coffee. The home was briefly listed on Airbnb for only $10 a night, and guests were offered an unlimited supply of Dunkin’ roasts. Three months later, Allswell, an online mattress and bedding brand at Walmart, has adopted a similar strategy for showcasing its products.On February 7, the brand began offering tours of its tiny home, which includes a bedroom, kitchen, bathroom, and living room, in New York City. Customers will be able to test out mattresses and bedding, with the option to purchase items on-site and have them shipped to their homes. The home will soon make its way across the country, stopping in cities like Philadelphia, Nashville, Los Angeles, and San Francisco. 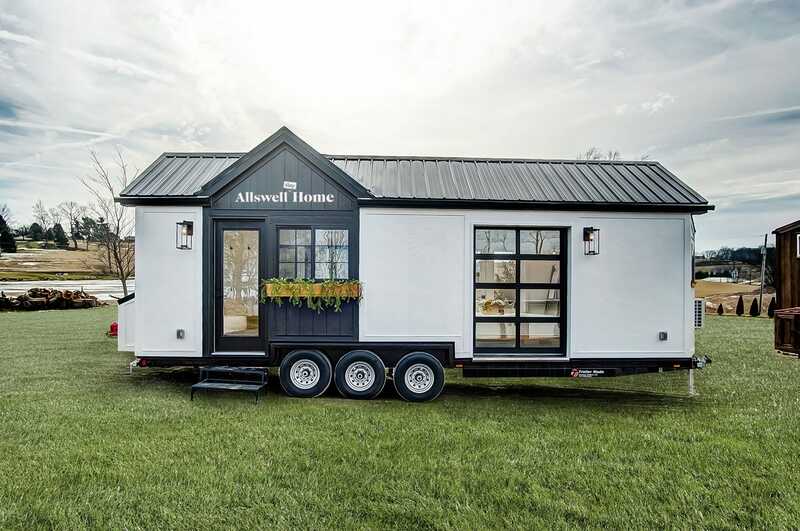 Allswell is also selling one tiny home model for $100,000. Take a look at the how the brand incorporated its first retail experience into less than 240 square feet. Allswell’s tiny home is smaller than most New York City apartments. 1 Allswell’s tiny home is smaller than most New York City apartments. 2 When customers enter the home for a tour, they’ll have the option to pick up promo codes. 4 As Walmart’s first digitally-native brand, Allswell only sells its products online, with the exception of its tiny home store. 5 The home’s kitchen includes a farmhouse sink and sizable refrigerator. 6 The custom-built couch converts into a twin daybed. 7 There’s even enough room for a washing machine. 8 Davich said the home is coated in a spray that protects against moisture and heat. 9 It also comes with a shower — a rarity among tiny dwellings. 10 Davich said the brand has already received inquiries from customers wanting to purchase the home. 11 One wealthy woman wanted to use it as a suite for her in-laws in the Hamptons. 12 Another young couple wanted to give up their New York apartment in favor of life on the road. When customers enter the home for a tour, they’ll have the option to pick up promo codes. The codes are randomly selected from a jar, and can range from a 10% to 20% discount to up to $500 off. As Walmart’s first digitally-native brand, Allswell only sells its products online, with the exception of its tiny home store. The home’s kitchen includes a farmhouse sink and sizable refrigerator. The custom-built couch converts into a twin daybed. There’s even enough room for a washing machine. Davich said the home is coated in a spray that protects against moisture and heat. The spray conserves energy by preventing air from escaping. It also comes with a shower — a rarity among tiny dwellings. Davich said the brand has already received inquiries from customers wanting to purchase the home. One wealthy woman wanted to use it as a suite for her in-laws in the Hamptons. Another young couple wanted to give up their New York apartment in favor of life on the road.